Looking for a recipe to use up the remains of a roast chicken, I came across this salad in the book The Art of Eating Well by Jasmine and Melissa Hemsley. I adjusted it slightly to suit the ingredients I had in the cupboard. Rather than using two cucumbers, I used one together with a sweet potato spiralized. I had pak choi, but used baby gem lettuce instead of the romaine or cos. Not having any spring onions, I finely sliced a white onion instead. The result was just as delicious and tasty. 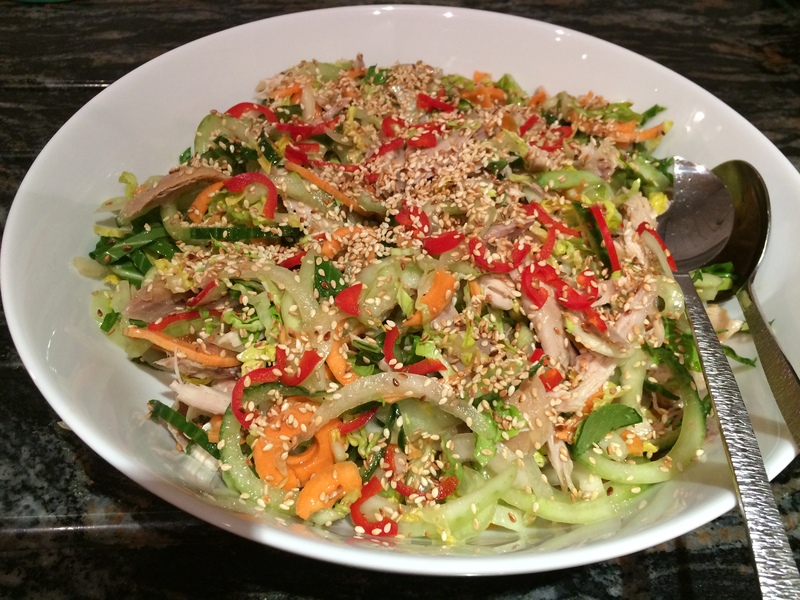 A refreshing salad with Asian flavours using up my left-over chicken. Gently toast the sesame seeds in a dry pan until fragrant. Use a spiralizer or julienne peeler to make the cucumber noodles. Or use a regular vegetable peeler to slice the cucumbers lengthways into wide pappardelle-style ribbons. You might want to cut the long strands in half to make them easier to eat. Prepare the dressing by whisking together all of the ingredients in a bowl. Slice the lettuce and pak choi into thin ribbons. Add to a bowl with the spring onion, coriander and cucumber noodles. Pour over the dressing and mix everything together (hands are best). Toss with the chicken. Mix well together, sprinkle with the sesame seeds and sliced chilli. If you want to make this in advance, everything can be mixed together except the cucumber noodles. Leave these until the last minute to spiralize and stir them in along with the dressing just before serving. This entry was posted in Dinner, Lunch, Salads and tagged Baby Gem Lettuce, Chicken, Dinner, Gluten Free, Healthy Eating, Lunch, Pak Choi, Salad, Supper, Sweet Potato, Vegetables, Wheat-Free. Bookmark the permalink.